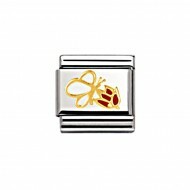 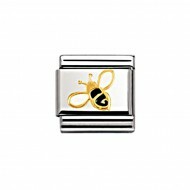 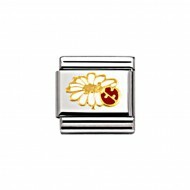 Composable Nomination Classic Gold and Enamel Nature Bee Charm, a stainless steel base link with 18ct Gold and Enamel. Composable Nomination Classic Gold and Enamel Nature Blue and Yellow Flower Charm, a stainless steel base link with 18ct Gold and Enamel. Composable Nomination Classic Gold and Enamel Nature Blue Flower no Stem Charm, a stainless steel base link with 18ct Gold and Enamel. Composable Nomination Classic Gold and Enamel Nature Blue Rose Charm, a stainless steel base link with 18ct Gold and Enamel. Composable Nomination Classic Gold and Enamel Nature Butterfly with Flower Charm, a stainless steel base link with 18ct Gold and Enamel. Composable Nomination Classic Gold and Enamel Nature Camelia Charm, a stainless steel base link with 18ct Gold and Enamel. 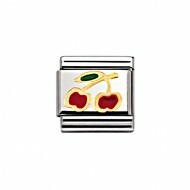 Composable Nomination Classic Gold and Enamel Nature Cherries Charm, a stainless steel base link with 18ct Gold and Enamel. 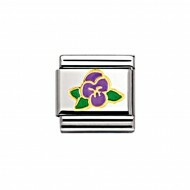 Composable Nomination Classic Gold and Enamel Nature Clover Charm, a stainless steel base link with 18ct Gold and Enamel. Composable Nomination Classic Gold and Enamel Nature Dragonfly Charm, a stainless steel base link with 18ct Gold and Enamel. Composable Nomination Classic Gold and Enamel Nature Edelweiss Charm, a stainless steel base link with 18ct Gold and Enamel. 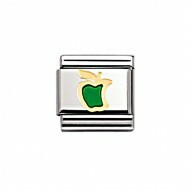 Composable Nomination Classic Gold and Enamel Nature Green Apple Bite Charm, a stainless steel base link with 18ct Gold and Enamel. 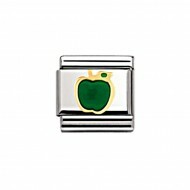 Composable Nomination Classic Gold and Enamel Nature Green Apple Charm, a stainless steel base link with 18ct Gold and Enamel. Composable Nomination Classic Gold and Enamel Nature Jasmine Charm, a stainless steel base link with 18ct Gold and Enamel. Composable Nomination Classic Gold and Enamel Nature Landscape Charm, a stainless steel base link with 18ct Gold and Enamel. 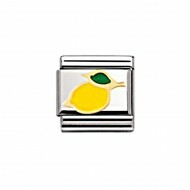 Composable Nomination Classic Gold and Enamel Nature Lemon Charm, a stainless steel base link with 18ct Gold and Enamel. 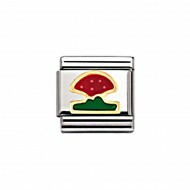 Composable Nomination Classic Gold and Enamel Nature Mushroom Charm, a stainless steel base link with 18ct Gold and Enamel. 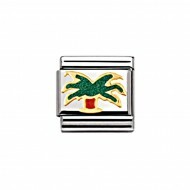 Composable Nomination Classic Gold and Enamel Nature Palm Tree Charm, a stainless steel base link with 18ct Gold and Enamel. Composable Nomination Classic Gold and Enamel Nature Peach Blossom Charm, a stainless steel base link with 18ct Gold and Enamel. Composable Nomination Classic Gold and Enamel Nature Pink and White Flower Charm, a stainless steel base link with 18ct Gold and Enamel. Composable Nomination Classic Gold and Enamel Nature Red and Yellow Flower Charm, a stainless steel base link with 18ct Gold and Enamel. 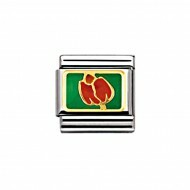 Composable Nomination Classic Gold and Enamel Nature Red Apple Bite Charm, a stainless steel base link with 18ct Gold and Enamel. Composable Nomination Classic Gold and Enamel Nature Red Flower no Stem Charm, a stainless steel base link with 18ct Gold and Enamel. Composable Nomination Classic Gold and Enamel Nature Shell Charm, a stainless steel base link with 18ct Gold and Enamel. Composable Nomination Classic Gold and Enamel Nature Strawberry Charm, a stainless steel base link with 18ct Gold and Enamel. 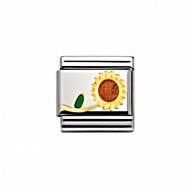 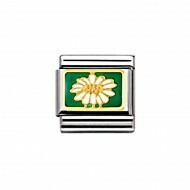 Composable Nomination Classic Gold and Enamel Nature Sunflower no Stem Charm, a stainless steel base link with 18ct Gold and Enamel. Composable Nomination Classic Gold and Enamel Nature Swallow Charm, a stainless steel base link with 18ct Gold and Enamel. 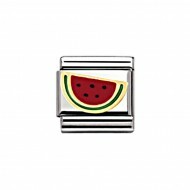 Composable Nomination Classic Gold and Enamel Nature Watermelon Charm, a stainless steel base link with 18ct Gold and Enamel. Composable Nomination Classic Gold and Enamel Nature White and Yellow Flower Charm, a stainless steel base link with 18ct Gold and Enamel. 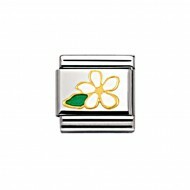 Composable Nomination Classic Gold and Enamel Nature White Flower no Stem Charm, a stainless steel base link with 18ct Gold and Enamel. 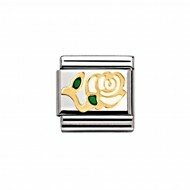 Composable Nomination Classic Gold and Enamel Nature White Rose Charm, a stainless steel base link with 18ct Gold and Enamel. Composable Nomination Classic Gold and Enamel Nature Yellow and White Flower Charm, a stainless steel base link with 18ct Gold and Enamel.